Breaking into the PC gaming world can be expensive. If you’ve got friends with gaming PCs, you might have heard them about their sweet new liquid cooling system that “only” cost a few hundred dollars. At those prices, it must cost an absolute fortune to build a gaming PC, right? It can if you build a bleeding-edge rig that’s meant to run games at max settings for years. But you can build a serviceable PC for only $400. Here’s how. Click on the product images to view the product on Amazon, where you can see more images in high resolution and check the current price. AMD’s mid-range processor is a significant step up from the Ryzen 3. It clocks at 3.6 GHz, and overclocks to 3.9. It’s also VR-ready. An upgrade from the Wraith Stealth Cooler that ships with the Ryzen 5. It runs quiet, and is rated for processors that pull up to 95W. The RX Vega 11 is an integrated graphics chip that’s built into the Ryzen 5 2400G. It’s a significant upgrade over the older RX Vega 8, and lets you run most modern games at medium to low settings. A single 8GB RAM stick with a cycle rate of 2400 MHz, which is as fast as the RX Vega 11 supports. You’ll get the most out of your rig with this RAM. The Asus TUF B450 has lots of connectivity options, from legacy PS2 support to being VR-ready. It also has 4 RAM slots, so you may never need to buy a new motherboard. An inexpensive, 5900 RPM HDD that’s good enough to get you started. It has plenty of capacity to install several games at once. This is a beefy, 550W power supply. It’s more than enough for this build, so you won’t need to replace your power supply when you upgrade other components. 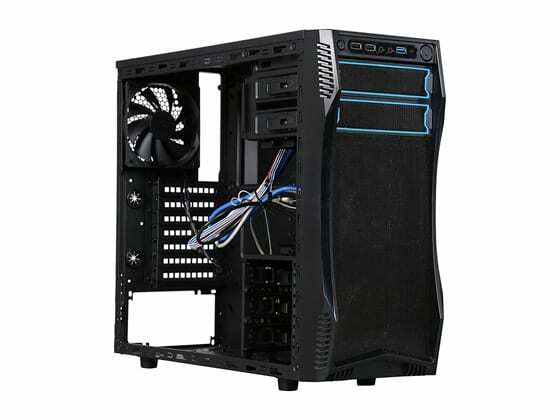 A very inexpensive case with three fans, five 3.5-inch internal bays, and three 5.25-inch external bays. That’s a lot of cooling power and plenty of space for expansion. To make this system work as well as possible, we had to set some ground rules. Before we take a closer look at all the parts, let’s talk about what we’re trying to achieve with our $400 gaming PC. Got a higher budget? See our $600 PC build guide. Or perhaps you’d like to save $100 for a weaker system? Here’s our $300 PC build guide. To begin with, we wanted to build a PC that runs at least as well as current gen game consoles. Anything less wouldn’t make any sense, since you can buy a brand new Xbox One X or PlayStation 4 Pro for less than $400. For this purpose, we chose the PS 4 Pro as a benchmark. It has a 2.1 GHz 8-core CPU, integrated AMD Polaris graphics, 8 GB of RAM and 1 TB of hard drive space. The Xbox One X has 12 GB of RAM, but that’s not practical on PC, and 16 GB of RAM would be prohibitively expensive. Our build has a 3.9 GHz quad-core processor with integrated Radeon RX Vega 11 graphics, 8 GB of RAM and a 1 TB hard drive. The faster processor with fewer cores is a slight upgrade, but basically a wash. The graphics are comparable, and the other specs are identical. The main benefit to buying a PC as opposed to a console is upgradability. Dollar for dollar, a game console is going to give you better performance out of the box than any gaming PC. But once you buy it, you’re locked in. If you want to upgrade, you have to wait for the next generation, and buy a whole new system. With a PC, you can upgrade as you go. Want to buy a new game, but need better graphics? Upgrade your graphics card. Want faster load times? Install a solid state drive, or more RAM. Want to improve performance in games with lots of NPCs or bots? Get yourself a new processor. We built everything around AMD architecture and their latest AM4 socket, so you can upgrade any single part without having to replace half your machine. The motherboard and the integrated graphics card are both VR ready, although at this price point we’d take that with a pinch of salt. Still, if you’re dying to get into VR, you can at least get your feet wet with some basic games at very low settings. Let’s not beat around the bush here; we’re building a $400 PC. To get a PC to run modern games at that price, it will have to be optimized for gaming, meaning it won’t do other things as well as you might like. For example, this PC doesn’t have a disc drive. Since most PC gamers download their games on Steam or another online marketplace, it didn’t seem like a smart way to spend a chunk of our limited budget. Another thing we skipped was a wireless card. These can be nice to have, but an integrated wireless card drives up the cost of your motherboard without doing anything to boost your gaming performance. It’s not that we don’t like these features. It’s just that they aren’t really necessary for gaming. Because everyone’s needs are different – and because you might want to add features later – we’ve included a large peripherals section at the end of this review that covers all the add-ons you might want to collect over the next few months. Now that we’ve set some expectations, let’s go over our parts one by one, and talk about alternative parts when applicable. Here’s everything you need to know about our components. The Ryzen 5 is AMD’s middle-tier CPU. 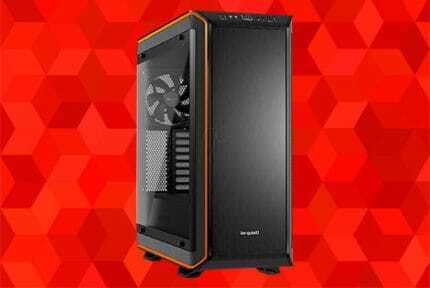 It has a maximum rated clock speed of 3.9 GHz, which is a slight upgrade over the earlier Ryzen 3’s maximum rating of 3.4 GHz. 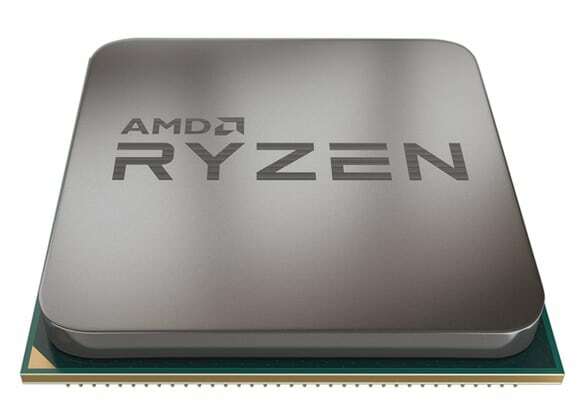 Where AMD really improved the Ryzen 5 over the Ryzen 3 was the addition of multi-threading to make this quad-core CPU simulate an 8-core unit. It also has better integrated graphics, but we’ll talk about that in a minute. The Ryzen 5 uses AMD’s newest socket, the AM4, which makes it as future-proof of an option as you can choose. It’s also VR-ready, although what exactly that even means these days is unclear. Realistically, most VR games are going to require a more powerful processor or at the very least a dedicated graphics card. The base clock for this processor is only 3.6 GHz, but it comes unlocked out of the box. We’ll leave it to your discretion as to whether or not you want to overclock it, but pushing it past 3.9 GHz is liable to overheat it, and will void your warranty. Even if you’re only overclocking to 3.9 GHz, it’s probably a good idea to use an aftermarket cooler, which we’ve included in our build. As we’ve mentioned, this processor includes an integrated graphics card, which we think is pretty good. If you absolutely, positively must have a dedicated GPU, your system is going to cost more than $400. That’s why we opted for a processor with integrated graphics in the first place. However, if you’re using a GPU you can save a few dollars on the processor by using the Ryzen 3 1300x instead. It clocks the same as the Ryzen 5, but doesn’t have integrated graphics or simulate an 8-core processor. Your rig will still be over $400, but not by quite as much. To begin with, the AMD Ryzen 5 ships with a basic cooler. The Wraith Stealth Cooler is made specifically for Ryzen chips, so it mounts beautifully, and will do a fine job of keeping your CPU cool. If you want to save a few dollars on your PC, particularly if you’re not going to overclock your processor, skip the aftermarket cooler and move on. On the other hand, the Wraith Stealth Cooler is only rated for 65 W or smaller processors, which is barely enough to cool the Ryzen 5. If you want to upgrade your processor, you’ll also need to buy a new CPU cooler to go along with it. The darkFlash CPU Cooler is rated to cool processors that draw up to 95 watts, so you can upgrade your CPU with confidence. Not only that, it will help you get the most out of your Ryzen 5 by letting you overclock it while still maintaining safe temperatures. It’s worth spending a few dollars on a cooler to get another .3 GHz out of your system. 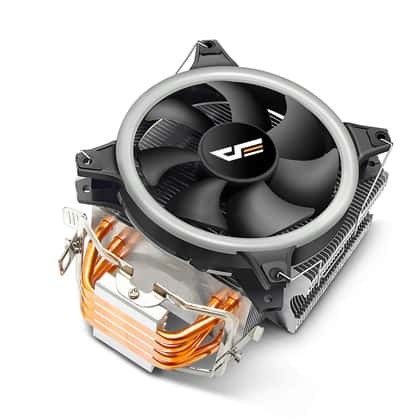 The darkFlash CPU Cooler includes a fan that’s regulated by the motherboard, so you can use your motherboard’s settings to tweak the fan speed if you desire. It runs pretty quiet at the default maximum of 1,800 RPM, but can be throttled back to 800 RPM. This might be a good idea in an office environment, but for a gaming PC we’d strongly recommend against throttling back the fan, since this will also decrease the cooler’s effectiveness. Best of all, this cooler has copper contacts, which are far better at absorbing heat than the Wraith Stealth Cooler’s aluminum contacts. As a result, it will not only keep your processor cool, but will respond more quickly to sudden spikes in CPU activity. The Radeon RX Vega 11 isn’t a separate graphics card. As we’ve discussed, it’s integrated into the Ryzen 5 processor in our build, so you won’t have to make a separate purchase. This has its advantages and its disadvantages. On the downside, an integrated graphics card doesn’t have dedicated video RAM. This puts it at a disadvantage compared to dedicated GPUs, which have their own onboard RAM for storing graphics assets. An integrated card has to rely on your PC’s RAM, which can slow it down, particularly if you’re playing a game with lots of textures which constantly have to be fetched from RAM. An integrated card also relies on your processor for a lot of its assets. This means that it will typically only operate at about half of its rated speed, compared to a dedicated GPU which will operate at full capacity when needed. For example, the Radeon RX Vega 11 is rated for a maximum of 1,200 MHz, so it actually maxes out around 600 MHz. On the other hand, an integrated hard is much, much more affordable. A basic dedicated graphics card will cost you almost as much as a second processor, while an integrated graphics card will only add a fraction to your processor’s cost. Secondly, higher-end graphics cards can often get bottlenecked by your processor or RAM. If either of those components is slower than your graphics card, you can waste a lot of money installing an expensive GPU that does nothing for you. If you really want to use a dedicated GPU on this rig, take a look at what we said about getting a slightly cheaper processor. Then, think about the NXDA-HD7670. It’s as affordable a GPU as you’ll find, and although it will put you over $400, it’s an improvement over the Radeon RX Vega 11. 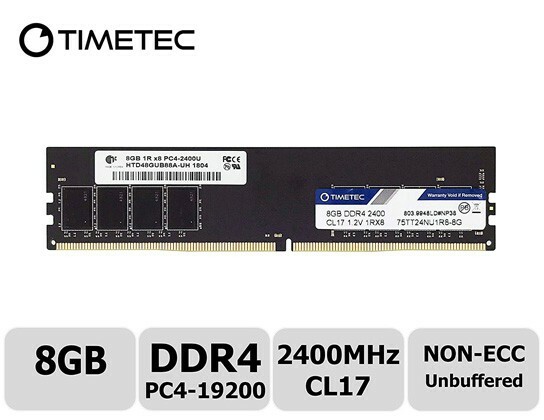 We chose the Timetec Hynix IC RAM because it has a cycle rate of 2,400 MHz, which is fast enough to get the most out of your processor without breaking the bank. It’s a single-slot 8 GB stick, which gives you enough RAM to run most newer games. The fact that it only takes up one slot gives you more freedom to upgrade, as opposed to two 4 GB sticks. That said, 2,400 MHz is on the slower side for modern gaming systems. This means that if you’re going to upgrade your processor or get a dedicated GPU, you’ll probably want to replace your Timetec Hynix IC RAM with something faster. If you can afford to spend a few more dollars to begin with, the Ballistix Sport LT is another 8 GB stick that has a cycle speed of 3,000 MHz. This is more up to speed with today’s faster processors, and will save you headache in the long run. We chose the Asus TUF B450 because it provided a nice balance between a future-proof machine and one that will also support your old peripherals. Seriously. This motherboard not only has three USB 3.1 ports and two USB 2.0 ports, it also has a Mini USB 3.1 port, and a PS2 port for your 10-year-old mouse or keyboard. Like all our other core components, the Asus TUF B450 uses an AM4 socket, so upgradability is good on that front. It also has a gigabit Ethernet port. While there’s no WiFi card on this motherboard, you’ll get lightning-fast speeds if you’re wired directly into the router. 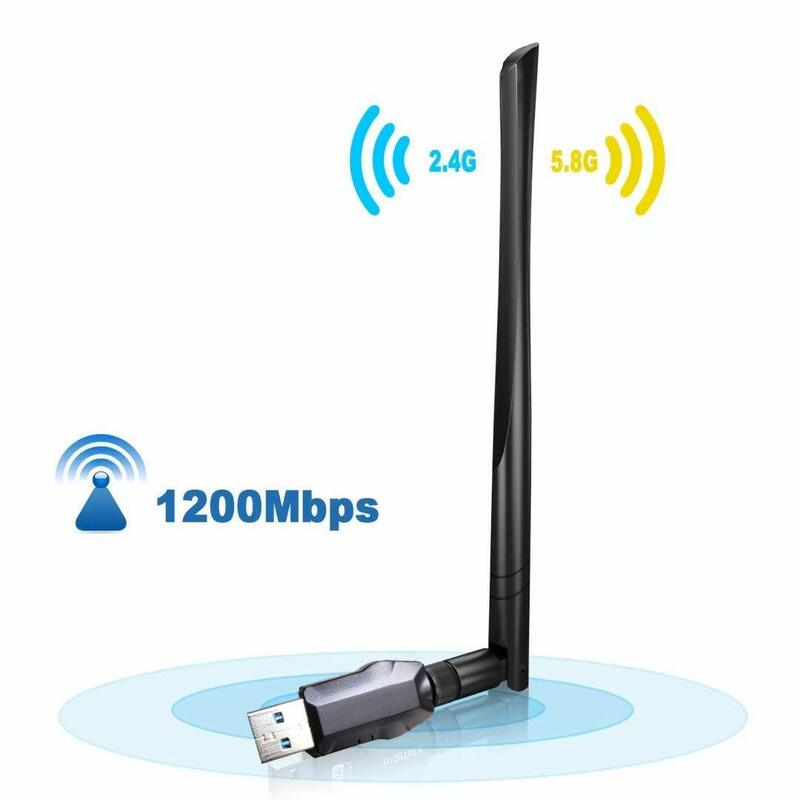 If you’ve got a good enough internet connection, you’ll have plenty of speed to play Fortnite or PUBG with 1 millisecond or less of latency through the Ethernet card. Like everything else in our build, this motherboard is VR-ready. The integrated RealTek sound card supports 8 channel HD audio, which is miles above the quality you’re going to get from even the highest-end games. 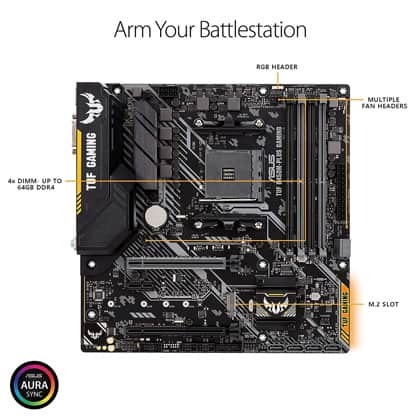 There’s a three-year manufacturer’s warranty on this motherboard, so you’ll know Asus has your back if something goes south. The Asus TUF B450 is also extremely durable. This has nothing at all to do with why we chose it, but the tough rubber on the wiring and the heavy-duty covers on the I/O ports are a nice touch. If every dollar counts and you’re not concerned about having a VR-ready motherboard, you can save about $15 by getting the regular Asus B450. This has similar specifications as the TUF B450, minus the VR capabilities. It also has an additional PS2 port and a Serial port – we can’t even remember the last time we saw a Serial port. These are nice backwards-compatibility features, but we were primarily trying to build a forward-looking, upgradable PC. For those purposes, the Asus TUF B450 is simply better. We chose this part because hard drives are a matter of preference: either you absolutely must have an SSD, or you couldn’t care less. As a result, we chose an HDD that has 1TB of capacity and is fast enough to get you started. It rotates at 5,900 RPM, which is slightly slower than high-end HDDs which rotate at 7,200 RPM. 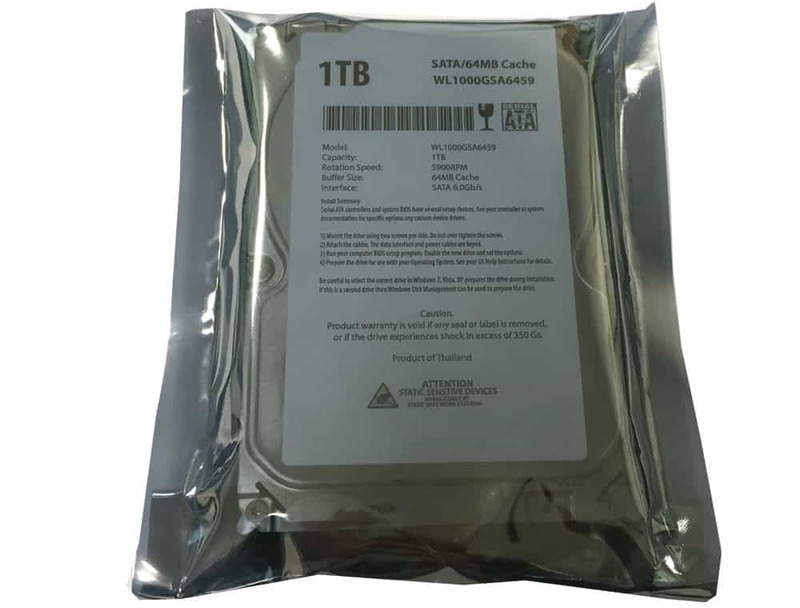 A terrabyte should be plenty of storage for most gamers. It’s enough to store more than a dozen average-sized Steam games simultaneously. If you’re not bothered by slightly longer load times, you’ll be just fine with this hard drive. If you are bothered by load times, you’d probably want to upgrade to an SSD regardless. We also made sure to choose a drive that was SATA III compatible and had a relatively quick transfer speed (6.0 GB/s), to make sure it was as fast as possible for a relatively low RPM drive. Yes, this is somewhere we chose to cut corners. You have to cut corners somewhere if you’re going to build a budget gaming rig. The plus side of cutting this particular corner is that it only affects load times, not anything that happens while you’re actually playing. If you absolutely must have an SSD for the fastest load times possible, you’re going to either have a very small hard drive or go over our $400 budget. That said, if you’re dead set on having an SSD, the Inland Professional 240GB Internal Sold State Drive is a good place to start. It costs about the same as the White Label 1TB, but will only hold about one game after you’ve installed your OS. But you’ll have lightning-fast load times. The Apevia ATX-BT550 is the most affordable 550W power supply on the market. Like our RAM, this is another choice we almost went cheaper on. After all, we only really need a 400W power supply to run our machine. Why pay for an upgrade? To begin with, power supplies are inexpensive, and a pain to upgrade once your system is already up and running. 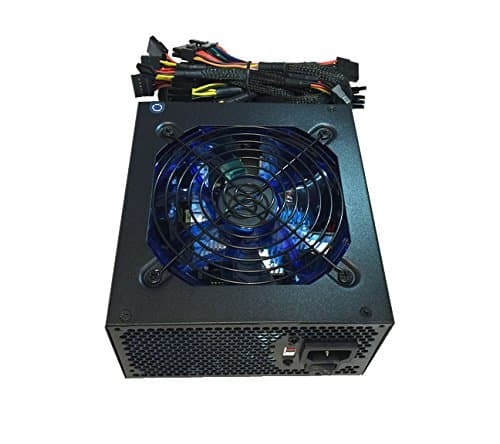 We could have saved $6 or $8 by choosing a 400W power supply, but you’d have to upgrade your power supply in order to get a new processor or install a GPU. Nobody wants to deal with that kind of headache. Better to spend the extra $6 or $8 to begin with and have an upgradable system. For another thing, this power supply comes with four SATA cables, while our case comes with none. 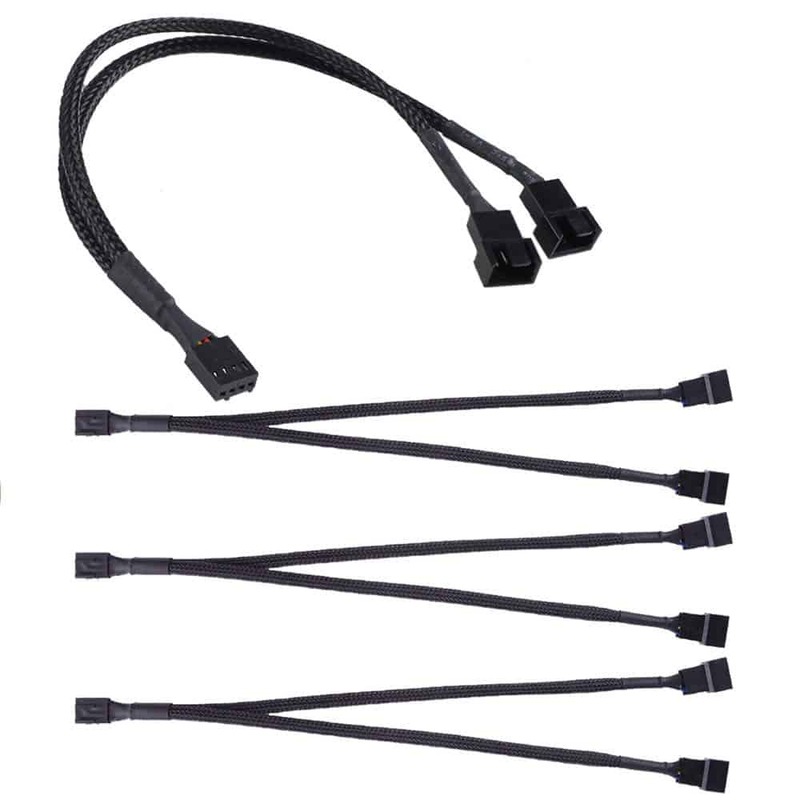 Considering that a 3-pack of SATA cables can run you a few bucks in and of themselves, it made sense to get a better power supply that includes them anyway. If you’re in a budget-critical situation and every dollar counts, this Coolmax 240-Pin 400W Power Supply will give you enough juice to get started. Just remember that you’ll need to replace it for virtually any other system upgrade. This is an absolute beast of a case for the price, which is one of the lowest you’ll find even for discount cases. 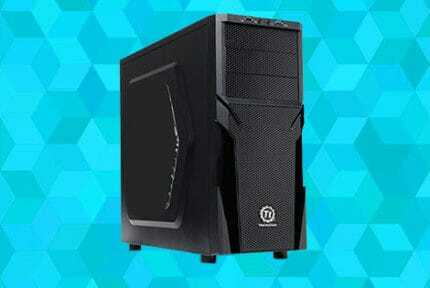 To begin with, it has three external fans, and space for a liquid cooling system. This is well beyond the scope of our $400 budget, and only two of the fans will even run with the motherboard we’ve recommended. No worries in that regard – the two fans will provide plenty of airflow to run this system. The third one is simply another upgradability option, as is the liquid cooling radiator space. There are two USB 2.0 ports on the front. Because they’re 2.0 and not 3.0, they’re not a great option for connecting an external hard drive or a gaming-critical peripheral like a mouse, but they’re more than good enough for popping in a flash drive or charging your phone. In terms of space, the Challenger S is tricked out. It has room for five 3.5” drives, and an additional two 5.25” bays. Hard drives, memory card readers, BluRay drives, they’ll all fit in this case with room to spare. Honestly, we’ve never understood why people are willing to spend a fortune on a PC case. It’s like spending thousands of dollars to get a new paint job on your car, without messing with what’s under the hood. There are no fancy color-changing LEDs on this case, just lots of cooling power and tons of upgradability. Congratulations! 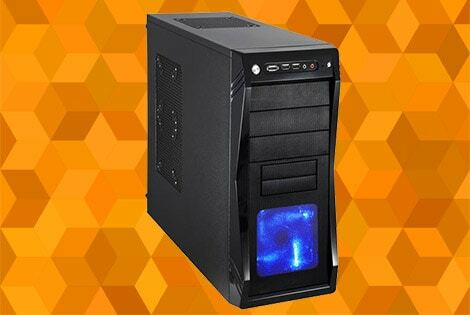 You’ve now built a fully functional computer tower for $400. Of course, a tower by itself is just an expensive doorstop. If you want to do anything with it, you’re going to need a few more things. In this section, we’ll cover the basics: a monitor, a mouse, a keyboard and, of course, an operating system. Since you may already have some of these things, we’ve listed them separately from the PC itself. That said, you won’t be using your new PC without them, so make sure you’ve got room in your budget for at least the basic versions of these peripherals. 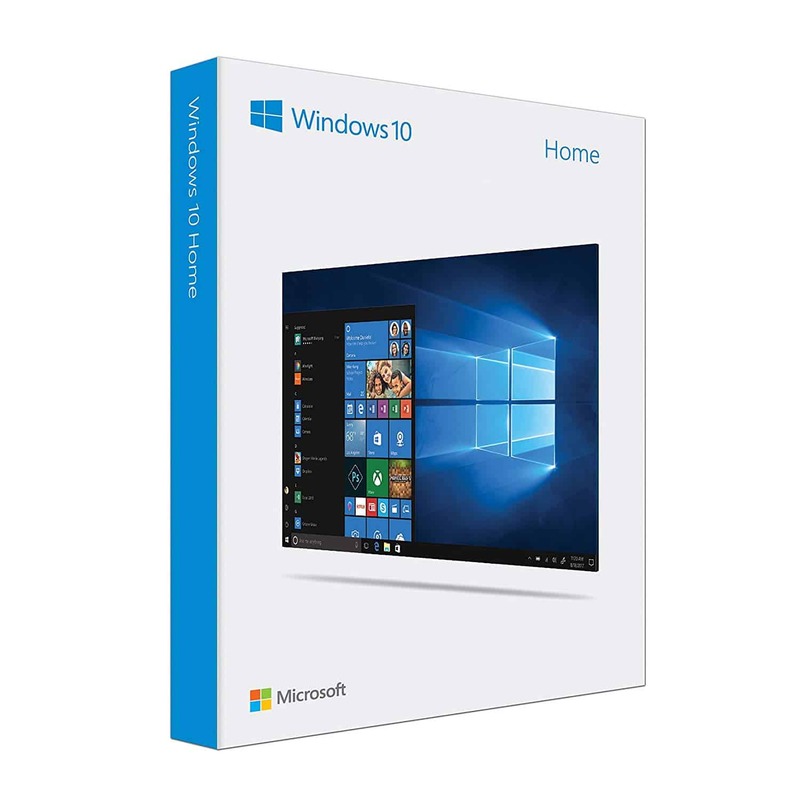 We chose the Home Edition of Windows 10 because the Professional Edition doesn’t offer any extra perks to gamers. If you do a lot of office-type work on your PC, you might want to consider an upgrade, but otherwise the Home Edition of Windows 10 does everything you need. We did choose the 64-bit operating system over the 32-bit version, since the 32-bit version wouldn’t get the most out of our hardware. We’ve linked to the USB drive install of Windows because it’s compatible with our build and doesn’t require a disc drive. If you’re adding a disc drive to your PC, you can also buy the DVD install, but there’s really no benefit to not using the flash drive. It works. You install it and your computer runs. You don’t have to run a C++ compiler every time you install a program. You don’t have to manually configure every last setting. Everyone writes software for it. All your favorite PC games run on Windows, and other apps are easy to find as well. If you’re considering a Linux build, keep in mind that Linux is a lot harder to use than Windows. You’ll need to take the time to learn how to use a UNIX command prompt and install programs using a C++ compiler. You’ll also be limited mostly to indie games, since most mainstream games won’t run in Linux. If your budget is already stretched to the maximum and you need to install Linux to get yourself up and running, we strongly recommend SteamOS. Like most Linux distributions, it’s free. It’s also designed by Valve, specifically for running games on Steam. It’s not made to use office programs, watch YouTube videos, or do anything else you’d expect to do with your PC. To install it, you’ll need access to a PC with a USB drive to download the install files and transfer them to your new rig. This is a budget monitor, but the plus side of our system is that we don’t need a top of the line monitor to get the best possible picture. Remember how we said we’ll only get 720p graphics outside of cutscenes? Here’s where we capitalize on that. 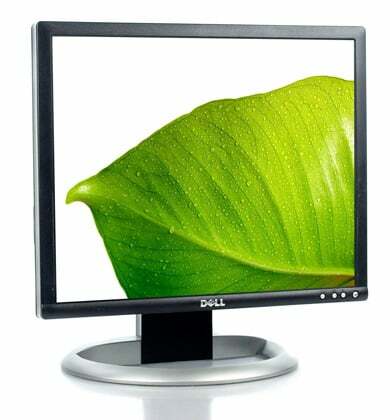 The Ultrasharp 19” monitor is sleek, lightweight, and fits on almost any desk. It has a resolution of 1280×1024, which is just short of true HD. It still looks great, and unless you’re a stickler for HD cutscenes you’ll get the maximum performance from this PC. The Ultrasharp 19” only has an RGB input, not an HDMI input, but this is more or less academic since you’re not getting true HD anyway and our graphics card has RGB outputs. But let’s say you’ve budgeted a few extra dollars for a monitor, and you want a better one. There are reasons for this, even though our build won’t support a better picture. For one, you’ll still get better resolution in cutscenes, or in movies if you decide to install a BluRay drive. For another, you’ll be future-proof against other upgrades. For a few dollars more, you can buy the Sceptre 20 Inch LED Monitor With Speakers. Not only does this monitor give you full HD, but it also has integrated speakers. Since you’ll need to have speakers on your system unless you’re strictly using headphones, this upgrade can end up being a wash.
Wow! You’re not going to see another quality gaming mouse anywhere near this price. This mouse has 7 buttons, which leaves four customizable buttons once you factor out the three regular mouse buttons. It also has adjustable sensitivity, with settings at 1,000 DPI, 1,600 DPI, 2,400 DPI and 3,200 DPI. On the one hand, this mouse is much more sensitive than your average mouse from Staples, at around the same price. On the other hand, it’s nowhere near as sensitive as some other gaming mice. It’s also wired. We think this is a good thing for a desktop mouse. Wireless mice are great for laptops, when you need to pack up your computer every day. Wired mice don’t require batteries, so they won’t suddenly crap out on you in the middle of a multiplayer match. If you’re a diehard fan of wireless mice, we have a couple of good options for you. 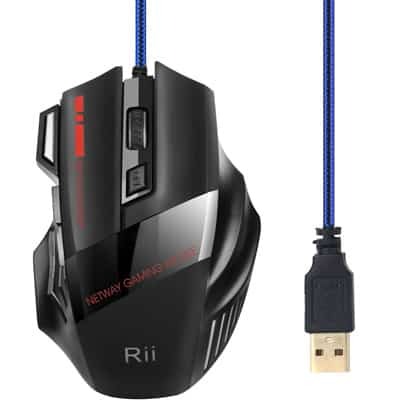 For a few more dollars than the Riii Professional, you can buy the J-Tech Digital Scroll Endurance Wireless Mouse. This puppy is not only wireless, it’s ergonomic. You hold it in your fist, vertically, like you’d hold a cup, instead of having a traditional mouse grip. On the other hand, the J-Tech isn’t a gaming mouse. It has no extra buttons, and while its sensitivity is adjustable, it has a maximum DPI of 1,600 DPI, which might just get you killed in some FPS games. Finally, we have the Corsair Dark Core SE, a wireless gaming mouse that comes at a hefty price. If your budget is running low, consider a different option. Still, this mouse has nine programmable buttons, and a super-low 1 millisecond of latency. That’s impressive, although it’s expensive for our build. 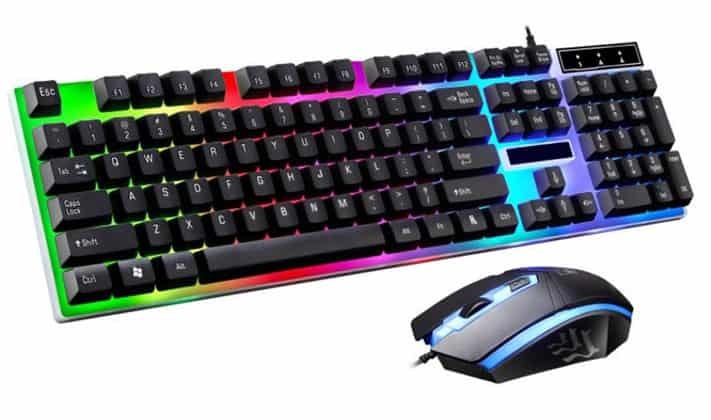 If you’re looking for a gaming keyboard at a budget price, the Lookatool LED Rainbow Color Backlight Gaming Keyboard is a great place to start. For people who are really in a crunch, this keyboard includes a mouse, although we’d recommend avoiding it unless you’re rooting change out of your couch to pay for your rig. This keyboard has a soft touch, customizable backlights, and has suspension style key caps. That means that these keys are spring-supported, so you won’t have as much sticking as you’ll get on a standard keyboard. Other than those features, this is basically a standard wired keyboard. If you want a true gaming keyboard, you’d be well served by paying a few dollars more for a VicTsing All-Metal Keyboard. This is a true gaming keyboard, with a tough metal skin. On top of that, you can remap your WASD keys to the arrow keys – and map them back again – with a simple shortcut button. The last keyboard we’ll mention is more of a wish-list item than a must, considering our PC is budgeted at $400. Still, it deserves an honorable mention if you’re contemplating future upgrades. The Razer Ornata Chroma has all the features of the VicTsing, plus a cushy ergonomic wrist-rest. It also features a whopping 1,000 Hz response time. Unless you can hit 1,000 keys in a minute, you’ll never fat-finger a combo again with this keyboard. The keys also respond with an audible “click” when you hit them, so you won’t be left wondering whether you actually hit the ctrl key or not. Finally, we’re going to talk about some additional peripherals that can improve your gaming experience. These are all purely optional, so you can skip this section if your budget is already stretched. If you’re looking for some affordable bells and whistles, though, look no further. We’ve got you covered. As we mentioned when we were going over the Rosewill Challenger S, you don’t really need all three case fans, but you’ll also only be able to power two of them using the Asus TUF B450’s fan heads. Not to repeat ourselves, but that’s plenty of cooling power for this build. If you decide to upgrade or overclock your CPU, though, it would be a good idea to get that third fan up and running. This fan cable splitter can attach to either of the case fan heads, powering both of them. The only downside is that you’ll only be able to control those fans as a pair, not individually. We’re not going to oversell these. The Cyber Acoustics CA-2012 speakers are a basic, no-frills pair of desktop speakers. So why did we pick them? Simply put, these are the highest recommended speakers online in their price range. They’re adjustable, and they have a separate headphone input so you won’t have to mess with your computer’s settings when you have to quiet down. 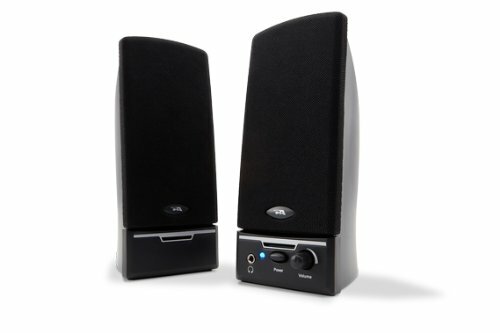 If you’re looking for more options, there are plenty of computer speakers that have separate subwoofers, or that make enough noise to require their own power outlet. This isn’t one of these speakers. We’re building a budget gaming rig here, so we’ve recommended some basic options. For space-conscious customers, Creative Pebble makes some smaller speakers. If you’re looking for true surround sound, Creative PlayWorks has a surround sound system that’s not totally outrageous. Still, if you’re in the $400 range, the Cyber Acoustics speakers should be more than sufficient to fill a room. For the multiplayer gamers among us, a headset isn’t optional – it’s a must. 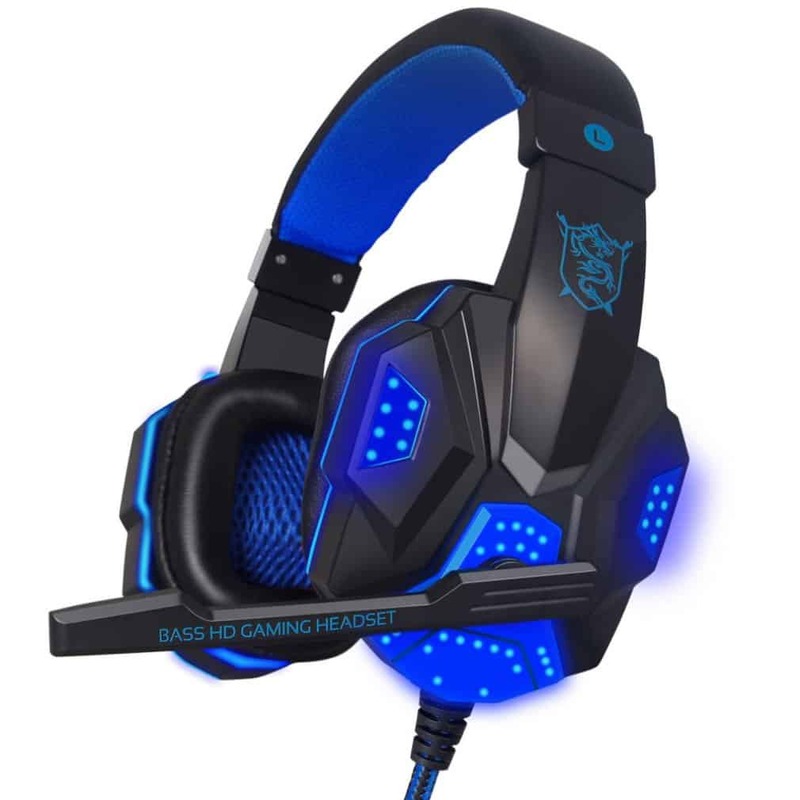 And for those gamers, we have the Livoty Surround Stereo Gaming Headset. This costs less than a comparable console headset, and lets you talk to your teammates as you listen. It connects via USB, and has fancy LEDs that light up when you’re chatting. If your girlfriend is never sure when you’re on a party chat, this headset is a great choice. It also has an in-line volume selector so your loudest teammates will never be too loud. We designed this rig with an HDD to save money. But let’s suppose you’ve had your homemade PC for a year, and you’re looking for more storage space with faster load times? In this case, consider adding a WD Blue 1TB SSD Drive to your build. It’s not the fastest SSD on the market, nor is it the largest. It is, on the other hand, highly recommended and extremely reliable. 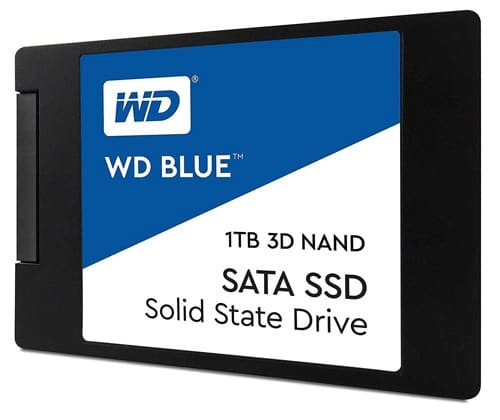 If you’re looking for a relatively inexpensive SSD to boost your load times, the WD Blue is a good choice. One area where we’ll freely admit our build is lacking is connectivity. Specifically, it doesn’t have a WiFi card. That’s fine for many people, but many others are also left wondering how they’re going to play their favorite games without a WiFi card. Enter the KingFuture USB WiFi adapter. This adapter plugs into your USB drive, rather than connecting via a PCI-E connection or SATA cable. It’s about as non-demanding as a WiFi adapter gets. Just plug it into your USB drive, and you’ll be up and running in no time. One of the main things we left out of our basic build was any kind of disc drive. Overall, this is a good choice for a $400 gaming PC. After all, nobody wants to spend 1/8th of their PC costs on a disc rive if they’re downloading all of their games. On the other hand, a disc drive is more or less a must if you want to watch movies. 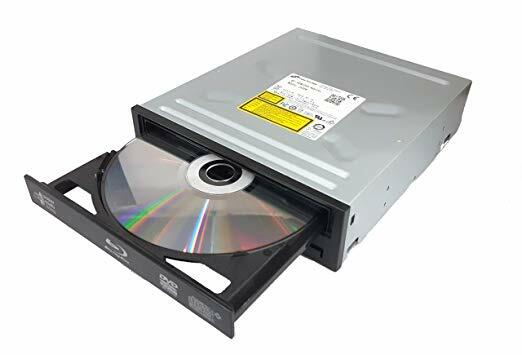 Moreover, it’s useful for install discs for newer games, as well as for older games you may not want to sacrifice disc drive space for. This drive has a read/write speed of 12x, which isn’t very fast if you’re burning a ton of media discs. Then again, that’s not what you’re building this system for, is it? For game installs, this drive is more than fast enough. For $400, you can build a solid gaming rig with nearly endless upgradability. Now, don’t get too excited. You won’t be running any recent games at max settings with this PC. You’ll be running most games in 720p at around 30 FPS, though, which is quite good for a budget system. Over time, you can install a dedicated GPU to give the graphics a boost, upgrade the processor, or add any of the many peripherals we covered. No matter what, this rig will get you playing today’s games from the get-go. For $400, that’s not bad.